Every gambler that is serious about winning ends up looking for strategies they can follow to guarantee wins. They think that Poker and Blackjack have some tricks to improve winning chances, so why not try and get some for games like slots. The fact is, not all casino games have tricks you can use to win most of the time. Some like slots are just games of chance and the sooner you accept this, the sooner you will be able to enjoy yourself instead of being too focused on winning. Having said this, there are strategies you can use to ensure that you minimize your chances of losing at slots. It starts with how you place your bet. Maximum bets only benefit the casino. Just because you place a maximum bet doesn’t mean the machine will be geared towards giving you the pot. These machines have a predominantly displayed sign on them that indicates by how much the jackpot is growing at any given time. The progressive slots are worth a maximum bet. These machines have a single play line. The first coin you put in the slot machine is supposed to activate any winning combinations. If you decide to put in additional coins, you are multiplying the amount you stand to win. If you are just looking for a win, then one coin is enough. If you are looking to win the largest amount of money possible, then you can place additional coins. Generally, the straight multiplier machines are a good bet in this case because they multiply the amount you can win by the number of coins you place in the slots. If you play two coins, the amount you would have won with one coin is multiplied by two and so on. However, you have to recognize that the more coins you use the bigger your losses. It’s better play a coin per turn than place three coins at a go trying to win a big amount of money, and only end up lose all three coins at one go. These are video slots, and they allow you to choose multiple pay lines, and bet using multiple coins. The coins you use can be of varying denominations. They have a benefit in that they provide bonus rounds with the potential for wins. These machines require that you use at least one coin per line. If you desire to place additional coins per line, ensure that this is money you are comfortable losing as there is no guarantee you will win just because you placed an extra bet. 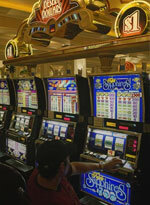 Just stick to playing maximum pay line with these slot machines. These are the general aspect of playing slots. The basic premise is that you are not supposed to play recklessly. Play only what you can afford to lose, and do it sensibly as prescribed above. This will give you a shot at coming home with a win or two.